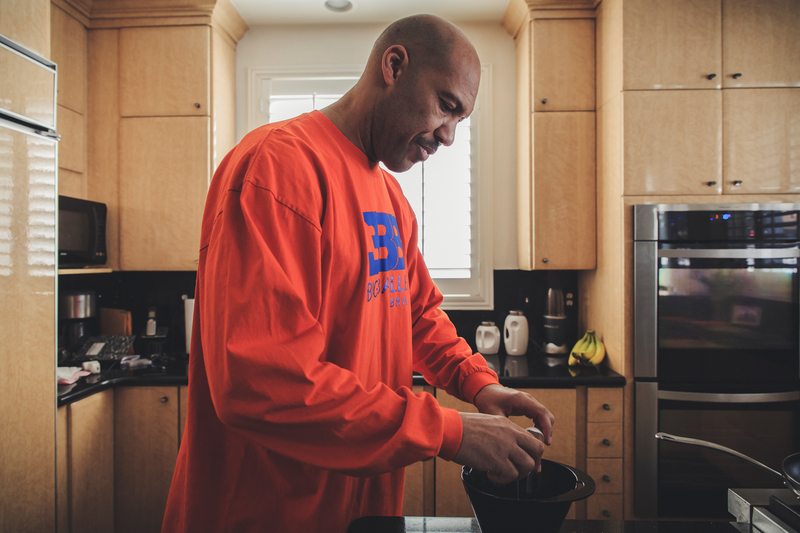 LaVar Ball opens the double-wide refrigerator and removes two dozen eggs, stacks of sausages, two tubes of frozen cinnamon rolls, a gallon of orange juice and 12 Kraft cheese singles. Soon, the sausage rounds are sizzling on the left back burner as he applies icing to the rolls on an adjacent counter. Then he’s got three burners, an oven and a mixing bowl going at once. He peels that clear plastic from each slice of cheese and painstakingly rips each square into small pieces and adds them to the eggs. He carefully tilts the bowl and beats the eggs with a whisk until they’re ready for the frying pan. After a quick glance over his shoulder to check the rolls, he carefully scoops the sausages with a spatula into two brown paper bags, which quickly become stained with grease as he shakes them. 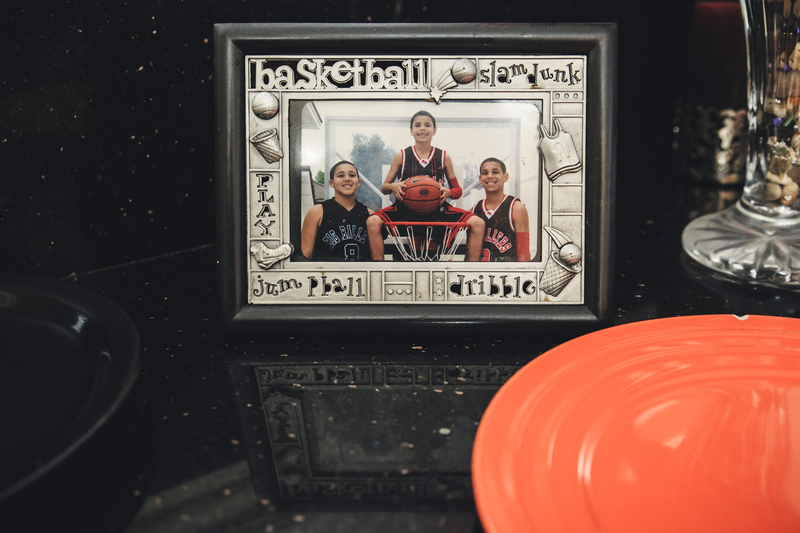 LaMelo, the 15-year-old prodigy and youngest of LaVar’s three sons, wanders into the kitchen wearing a T-shirt that reads “Talk Is Cheap” and scopes the spread before exiting without a word. “You hungry, Monster Man?” asks LaVar in his customary outside voice. The night before, the pipe cleaner-limbed wunderkind with area code range, notched a 17-point, 15-assist, 10-rebound triple-double in the first round of the California state playoffs. It isn’t even 9:30 a.m. and he has already put up 100 shots at the park down the street. The boys are always hungry. Breakfast is usually an event. Grocery bills by the thousands. The elder Ball has become one of the most visible figures in basketball due to his tireless promotion of his talented brood and his seemingly magnetic attraction to any microphone or camera pointed his way. The audacious absurdity of his decades-long plan to get all three of his three boys to the NBA is exceeded only by the increasingly bold, eye-roll-inducing boasts that have made him a one-man 24-hour news cycle. Yet his boys keep sailing over the bar he set outlandishly high, checking the boxes and stuffing their resumes with head-scratching feats. There’s the mythical high school national championship, the systematic destruction of state scoring records, a pending top selection in the NBA draft, which all lend legitimacy to LaVar’s madness. His need for control and organization is evident even with his back to the kitchen traffic and his arms wrist-deep in suds. LiAngelo, the UCLA-committed, high-scoring middle child, wanders into the kitchen. LaVar looks over his right shoulder as he does the dishes and nods at the kitchen trash can, which is brimming with refuse after breakfast. LaMelo Ball (right) and LiAngelo (left) eat breakfast together. They’re both on the rise as young up and comer high school basketball players but at home they’re simply just brothers. “That’s you,” he says to the senior, who dutifully empties the trash into a large container in the garage and replaces the bin with a fresh white kitchen trash bag. When LiAngelo returns to straighten up the kitchen, LaVar puts his right hand on the back of his neck and whispers in his ear. A small moment between father and son when there are no microphones or cameras trained on them. A moment later: “I didn’t think you were gonna get up like that,” chuckles LaVar about a dunk he had the night before. “Get ’em, Gelo.” It draws a faint smile from LiAngelo, who saunters up to the quiet of his room. True to form, LaVar was right about the eggs. When told so, he tilts his head back and slightly to the right, purses his lips and flashes a knowing smirk. It only took basketball’s latest phenomenon — a hypercompetitive father and his three prodigy sons, 20 years to become an overnight sensation. From the moment he chose his wife in college, supposedly because of her “length, height and breeding hips” when he saw her walking down the hallway after class to Lonzo’s star turn in the NCAA tournament, each step to glory has been carefully charted and planned by the outspoken patriarch. A photo of LaVar’s 3 children sit on the kitchen counter. LiAngelo, the middle child, stands on the left. LaMelo, the youngest of all 3 sits in the middle, and Lonzo, the oldest, stands on the right. In recent months, the Ball family has taken up residence virtually everywhere — from social media feeds to the forefront of the basketball world’s collective conscious. Think pieces on Lonzo’s funky jump shot. LaVar’s viral proclamations about his sons’ unique brand of genius. Backyard Snapchat high-jinks. The self-conscious and self-generated buzz surrounding the Balls has elevated them to a level of basketball ubiquitousness unheard of even in the social media age. Who Lonzo’s girlfriend? Does Melo have Snapchat? When does LiAngelo get his braces off? Where do they hangout? Does anyone from Chino have class with them? They can rap too?? Lonzo, 19, is the stoic, easygoing, likely top two pick in June’s NBA draft and the face of a franchise in waiting. His transcendent ability has morphed UCLA from a sub .500 team into a legit Final Four contender, sparking comparisons to Jason Kidd and Magic Johnson. The silky smooth, 6-6 pass-first setup man has draft prognosticators, general managers and the Twitter rabble falling over themselves to proclaim him The Next Big Thing. LaVar Ball says that his son, Lonzo, is going to be able to sharpen his tools now that he can be “100 percent in” at the pro level. LiAngelo, 18, a 6-6 soft-spoken shooting guard in a tight end’s body, possesses a quick trigger, excellent footwork and brutish finesse. He’s registered five games of 50 or more this season including a 72-point performance in December 2016 and heads to UCLA in the fall. LaMelo, 15, inquisitive, playful, who committed to UCLA before ever playing a high school game, set the basketball world ablaze in February by scoring 92 points in a single game, including 41 in the last eight minutes, making him arguably the most famous high school basketball player in the country. Doctors say he could grow another four inches, which has LaVar imagining a 6-7 Stephen Curry with an unlimited catalog of dribble moves and legitimate range to 40 feet. The matriarch of this brood is Tina, 49, a standout basketball player at Cal State-Los Angeles who’s been married to LaVar for 21 years and balances out his bombastic personality. The 6-foot middle school physical education teacher, who once averaged 18 rebounds her senior year of high school, has worn many hats, from ferrying the children to school to sharing cooking duties — her strawberry pancakes come highly recommended — to checking homework. Together they formed Big Ballers VXT AAU and its accompanying clothing line. In the early days of the brand, she helped handle orders and print early designs with a small screen press right there in the family living room. But it’s the elder Ball, an affable 49-year-old personal trainer with a hulking physique and quick smile, who gets the lion’s share of the headlines. Two months ago he was mostly known to those who orbited the realm of Southern California high school hoops. Loud, brash and unapologetic, LaVar has since rocketed himself to fame on the strength of his sons’ basketball feats and his own outlandish claims. Nearly every day in March, LaVar has done a TV or radio hit … usually followed by a torrent of criticism from professional athletes, debate show hosts or former players. My boys are going to be better than Jordan. All three will be one-and-done. We’re coming into the league with our own brand. My boys won’t change the league, they’ll change the game. Start the bidding at a billion. This is a movement. We were built for this. Steph who? UCLA guard Lonzo Ball, left, shoots as Washington State guard Charles Callison defends during the second half of an NCAA college basketball game, Saturday, March 4, 2017, in Los Angeles. He’s declared Lonzo better than Russell Westbrook, LeBron James and Curry, arguably the NBA’s three best players. LaVar memes, headlines and debates are a daily occurrence. There are dozens of top 10 lists ranking his most outrageous statements. His comments even sparked the trending topic #LaVarBallSays. Simply put, he’s arguably already the most discussed sports figure of 2017. Social media users cry Ball fatigue. He’s been compared to stage parents Richard Williams and Earl Woods and Kris Jenner. Then there’s the inevitable chorus of mean tweets rooting for the Balls to fail just to silence LaVar, signaling the early rumblings of a possible Ball backlash. But Ball’s strategy goes beyond seemingly trolling. Each time a basketball A-lister takes the bait and LaVar’s name makes the headlines, it’s normally followed by a television appearance in which he’s outfitted head to toe in the Big Baller Brand clothing line. Hats go for as much as $100, shirts for $70. Despite spending virtually nothing on advertising, LaVar said, the brand gets about 50 orders a day through its website, thanks largely in part to his visibility on television. His newfound celebrity also boosts his primary business, Big Ballers Training, in which he charges $45 a session to train young athletes. Operating mostly out of his backyard, a local park and the hills behind his house every week, he’ll put two dozen kids ages 8 to 17 through the same conditioning and shooting drills he ran his boys through, all with the idea of creating the next generation of superstars. LiAngelo lies back on the bed of his second-floor bedroom. It’s 11 a.m. on a lazy Saturday morning in March. There is a basketball-shaped pillow on the bed, a bewildering number of remotes, typical teenage clutter. A crisp MCM backpack sits on the floor near a pair of red, white and blue LeBron Soldier 10s, his game sneaks for the last month of the season. He’s got one eye on a Kentucky-Alabama matchup on the 28-inch, wall-mounted flat-screen, the other on his Instagram. Melo walks by with a towel draped around his waist and ducks his head in. “Who’s the most famous person you know?” asked LiAngelo. “Me,” he replied without hesitation before scooting into his room. Melo returns a few minutes later clad in skinny camouflage sweatpants and dark green Adidas running shoes. It’s not yet noon and he’s changed his shoes three times. He pulls a gold chain with a crucifix off a hook on the wall and slips it around his neck. He plops down on the edge of the bed, his mop of Sideshow Bob-esque hair blocking half the screen. Their fame is strangely juxtaposed with an everyday normalcy. Hanging out in LiAngelo’s room, they are not part of an emerging basketball dynasty. They are teenagers. 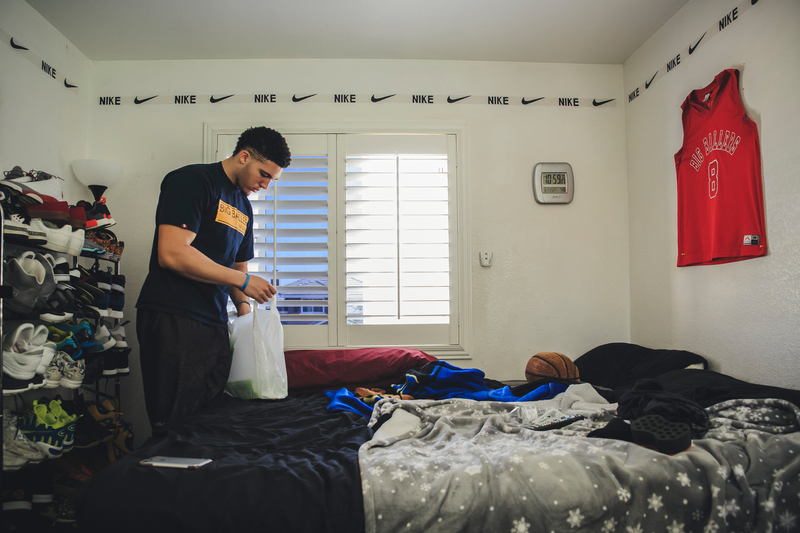 LiAngelo does a bit of cleaning inside his room. It’s a typical teenager’s bedroom clearly showing his love for basketball including his large shoe collection and his Big Ballers AAU basketball jersey. The boys are exceedingly polite, humble and as quiet as their father is brash, particularly around strangers, where answers are reduced to soft-spoken short sentences. They rarely bring up their athletic achievements and at times seem embarrassed by the attention they attract. LaVar bought Lonzo the same Beamer the year before. In typical Ball fashion, he taught them to drive at 12. Between games and workouts, LiAngelo cuts hair for pocket money. A new pair of shape-up clippers sit on his nightstand. He charges teammates and friends from school $15 a head for a trim and shape-up. He tightens up Melo’s blond locks for free and came up with the signature zigzag on the side of his head. And, yes, that’s his natural hair color. “The longer it grows, the lighter it gets,” said Melo. He’s never had a job, so Melo’s money comes from dad. Later he’ll wrangle $20 from LaVar so he and LiAngelo can stop off for strawberry smoothies before hitting the car wash. There are at least a half-dozen flat-screens in the house, but they don’t have League Pass. And surprisingly the two youngest have never been to an NBA game. LiAngelo is undecided about whether he’ll attend the prom, but maintains an active social life and is allowed to stay overnight at friends’ houses as long as he calls home first. Melo’s curfew is midnight, but he spends most of his time at home, which is usually teeming with friends and relatives. The youngest is hardly moved by his internet celebrity and rabid Instagram following, which exceeds a whopping 1 million, making him the most followed high school athlete in America. It hardly matters that courtside tickets at Chino’s playoff games have gone for more than $500 or that celebrities and athletes such as Los Angeles Rams running back Todd Gurley, former NBA player Lamar Odom and rapper The Game have seen them play in person. But it is kind of cool when Redskins wide receiver DeSean Jackson texts him.One of the most striking things about Melo is just how young he is. His body language, lack of eye contact, monosyllabic responses and inner emotional pendulum that swings from hyperfocus to general disinterest all scream high school freshman, which technically he is, considering LaVar enrolled him in first grade a year early so the three Ball boys could play varsity together for a single season eight years later. Nothing cracks him up like World Star videos. Especially the ones featuring players falling down. Crying face is his go-to emoji. His playlists include Migos and Lil Yachty, he puts syrup on his eggs and has never heard of the Tecmo Bowl video game. He’s not interested in tattoos because he thinks his dad wouldn’t approve. There’s a hand-drawn self-portrait on his wall, complete with a gap-toothed smile that has since been corrected by braces. His room is by far the cleanest, with a closet full of well-organized sneakers and a bed that always gets made. He’s got the gray camo Nike Foamposites and the PS4 controller to match. He’s got a thing for Foams too but the young sneakerhead’s $250 tennis ball-inspired Volts don’t even make the shoe rack. A Kobe Bryant basketball card and UCLA ticket stub from a home game against Arizona State with Lonzo’s likeness are thumbtacked to his wall. Like LiAngelo, he talks to older bro Lonzo three times a week. The UCLA freshman tries to make it home on Sundays, driving his Beamer the 48 miles from Westwood. On a previous weekend trip home, after copping a pair of Moccasin slippers from LiAngelo’s closet, Lonzo kicks back on Melo’s bed and records an Instagram Live video.The sole purpose of the taping is to share his favorite hobby with the world: riling up his youngest brother. The laughter-filled back and forth is as chaotic as it is funny. It’s one of the few times the soft-spoken trio’s decibel level can rival their father’s. Melo paces in a burst of energy, his cool facade cracking as he tries in vain to connect with a comeback. But Lonzo’s barbs come as fast and easy as a no-look in transition. Melo shrieks with disapproval and the brothers break up laughing. “Damn, I’m on this boy’s dome!” shouted Lonzo. The fun is only interrupted when LaVar’s voice booms from downstairs. “Melo, get down here,” shouted LaVar. “Coming,” the boy dutifully replied. LaVar Ball grew up in South Central Los Angeles, the middle of seven children — five boys and two girls — born to Anderson “Big Yank” Ball, who worked as a security guard to support his large family. LaVar and his brothers — LaValle, LaFrance, LaRenzo, LaShon — would make the rounds to the city’s best runs at nearby spots like the gym at Dorsey High near Crenshaw to Rogers Park in Inglewood to sun-parched blacktop battlegrounds in Baldwin Hills, a black hillside enclave not far from the airport. They played a physical fast-paced brand of ball. The only thing harder than the fouls were the attitudes. If it jumped off, they were each other’s own protection. They each went on to varying levels of success at local public schools Westchester and Canoga Park, where LaVar’s burly style earned him a scholarship to Washington State. But with limited success in his freshman season — 2.2 points per game in mostly mop-up duty — he transferred to Cal State-Los Angeles in East L.A. just off the Interstate 10 freeway. After graduating, LaVar fielded a sprinkling of offers to play overseas that he said would have netted him about $40,000 a year. During a summer pro-am basketball league at Loyola Marymount, he was spotted by the coaching staff of the New York Jets, who were cutting through the gym to save time getting to their bus after a team workout. LaVar Ball cooks breakfast for his two teenage sons. He jokingly refers to the breakfast as “LaVar’s famous cheese and scrambled eggs”. Floored by his size, they offered him an opportunity to try out on-site. He explained to them that he didn’t play football in college. Undeterred, they gave him a plane ticket and directions to the Jets’ practice facility in Hempstead, New York. LaVar said he weighed in at 270 and ran a 4.6 40 while bench pressing 500 pounds. They tried him at both defensive end and tight end. While he showed promise, LaVar said, new Jets head coach Rich Kotite drafting Penn State tight end Kyle Brady with the ninth overall pick in the 1995 NFL draft sealed his fate. So he followed his tight ends coach to the Dom Capers-led Carolina Panthers, where he was good enough to make the practice squad, earning $6,000 a week. LaVar returned to Los Angeles in 1996 and used the money he earned in the NFL to buy his first new car and a five-bedroom, two-story house in Chino Hills, an affluent, burgeoning Los Angeles exurb surrounded by rolling hills, wandering cattle and little else. He and college sweetheart Tina Slatinsky were married shortly after that. To earn money, he began training neighborhood kids who wanted to excel in football and basketball. Parents were won over by his enthusiasm and dedication, and soon a parade of kids showed up at his doorstep to go through shooting and passing drills followed by elaborate conditioning exercises. But his real focus were his own boys, whom he trained seven days a week. From the time they could walk, LaVar would have them hopping up steps or onto furniture. They graduated to pull-ups and body dips on equipment LaVar installed in the backyard. Soon they were sprinting up steep hills on the edge of Chino Hills State Park a full court heave from their home. They would take occasional summer vacations, usually road trips, to San Diego or Las Vegas when they weren’t training. When the boys were 4, 7 and 8, they took their only trip to Disneyland. On Christmas morning they could usually find toys, electronics and video games under the tree. On lazy afternoons they would wrestle with the family’s rottweilers. Lonzo’s favorite was Zeek. To maintain control of their development, LaVar turned down offers to play for well-known travel teams and he and his wife created the 17-and-under Big Baller VXT AAU team, which he coached himself. He installed a high-octane offense that thrived on full-court outlet passes, 30-foot 3s and pressing the entire game. “It’s the only way we’ve ever played,” said Lonzo. When the boys entered high school, LaVar chose to send them to local Chino Hills High instead of traditional prep powerhouses. Their style of play went with them and they began to raise eyebrows when Lonzo and LiAngelo led a tiny school with no basketball tradition to the state finals in 2015. Last season, with all three Ball boys playing alongside one another, the Huskies went 35-0 to capture their first California State title and finished the season No. 1 in the country while averaging 98 points in a 32-minute game. Chino Hills beat 11 ranked teams in what many consider one of the greatest high school basketball seasons in history. That level of success has afforded LaVar uncommon power, which gives him his most sought-after commodity — control. He jealously guards his boys’ development and has the last word in all of their affairs. His approach has irked sneaker companies, opposing coaches and school officials. But no one has felt LaVar flex more than first-year Chino Hills head coach Stephan Gilling, an assistant coach last season who inherited an undefeated national champion. LaVar regularly shouted directions to LaMelo and LiAngelo during games from his courtside seat. Both boys have played every minute of every game this season and there is an unspoken understanding that they are never to be taken out. “If he takes them out, I’ll stand up and tell them to stay in,” said LaVar. Both boys played 1,056 of 1,056 possible minutes this season. The coach and the parent butted heads all season before they stopped speaking after Gilling refused to let LaVar in the locker room after a December 2016 game in which tempers flared. On March 25, in front of 10,258 fans at USC’s Galen Center, in a wildly entertaining but disastrous 83-80 overtime loss for Chino Hills, the wheels came off the bus. The Ball brothers, plagued by ice-cold shooting and poor shot selection, finished 17-65 from the field. After the game, there were several heated exchanges in the locker room. “He committed the cardinal sin of cussing out Melo after the game,” LaVar said of Gilling. “He blamed the loss on him. That was it. So I told my boys to do an acting job. Nod your head when he talks, but when you’re on the court, do what I tell you. LaVar once trained Gilling at the age of 14 in the very backyard he turned his boys into superstars. But that relationship is all but over. “He had to go ahead and be a hardhead and try to do things his way,” said LaVar. “This is his last year. One-and-done. He’s gone. I will definitely have a hand in picking the next coach. He’s not welcome here anymore. LaMelo slides open a screen door and exits the kitchen to their backyard sanctuary: a 20-by-30-foot concrete basketball court — which LaVar and the boys laid themselves — complete with glass backboards and 3-point line framed by an 8-foot-deep pool to the right and barbecue area with blue ceramic tiles to the left. LaVar rebounds as LaMelo and I take turns chucking shots — me from the top of the key, Melo from out of bounds deep in the left corner. I drop in three or four 17-footers from the top of the key without a miss. With each make LaVar dishes out his customary encouragement. “Chris ain’t miss yet,” says LaVar. Melo clangs a couple off the side rim from deep in the left corner. The 60 seconds of encouragement is like a motivational shot in the arm. So I make my form sharper still. LaMelo (right) takes a long distance shot while his father (background) watches on. This is the same court where LaVar trained his sons to become highly coveted high school basketball players. Melo drops one in from 30 feet. I focus all the more to hit bottom so as not to disappoint lest the flow of positive encouragement cease. It’s a tiny glimpse into the effect of LaVar Ball. In between shots I try to imagine 20 years of this. But the words ultimately aren’t for me. They are for Melo. “OK, we’ll see,” says Melo, accepting the challenge. He tightens up his two-hand push shot and rips off eight in a row. For good measure, Melo moves to the other side of the court, ducks through a gate and steps onto the pool’s diving board. I press up, closing out with a fully extended hand in his face. I watch the flight of the ball as if looking up from underneath a rainbow.His 35-foot bomb drops through the net without so much as sniffing rim, sending oohs that rise above the concrete proving ground. “There you go, Melo Dip!” shouts LaVar. Another vanquished foe. This place has played host to a million of these frenzied moments. SC Featured: Ball Or Fall – How The Ball Brothers Are Looking To Change Basketball! Once Lonzo and LiAngelo came to blows after a one-on-one matchup devolved into a series of hard fouls. “We just started swinging,” recalled LiAngelo. “Nothing in the face, though. The atmosphere was about as raucous as Chino Hills had seen all year. As usual the tempo redlined. The 4,000-seat gym on the campus of El Camino College in Los Angeles that played host to this CIF California Open Division State playoff game was standing room-only and shook from the starting introductions. Bishop Montgomery was talented, deep and prepared. Their student section was creative and unrelenting. When Melo dribbled the ball out of bounds, they chanted “Fun-da-mentals.” When LiAngelo went to the line, he was greeted with a chorus of “You’re no Lonzo.” Bishop Montgomery essentially sacrificed offensive rebounding to beat Chino back on defense to thwart its vaunted fast break. It worked. The defending champs fell. After the game, LaVar Ball made his way slowly across the court to the Chino Hills bench. His father tried to put a positive spin on the loss. Lonzo put his arm around Melo. LiAngelo, who had just played his final high school game, was despondent. They stood there commiserating, trying to figure out what went wrong before three generations of the Ball family shuffled out into the crisp night air. A visibly frustrated LiAngelo darts for the team bus that would ferry them back to Chino Hills. Lonzo jumps into a waiting car that will take him off to UCLA, the tournament on his mind. Melo, flanked by classmates, stops off at a row of vending machines. It took him several tries to get the machine to take his dollar bills so he could get a 16-ounce Dasani water. As he makes his way the 100 or so yards to the bus, cheerleaders from Bishop Montgomery wave at him mockingly. Dozens of fans trot alongside of him with cellphone cameras raised high. Some dash out in front to take impromptu selfies. A group of boys jeer him, though it seems to come from a place of jealousy rather than pride for one’s school. LaVar hugs his father, who makes his way to his car in a nearby parking lot. The players board the bus and the last of the selfie-seekers scatter into the night. Each member of a budding basketball dynasty heads in a different direction until LaVar Ball is by himself. Soon he and Lonzo will take their act to the NBA. LiAngelo will head to Westwood uncertain how his game will translate. For the first time in his life, Melo will live without his brothers in the house he grew up in. Each member off on his own to face the toughest test of his career. But The Plan doesn’t stop. Every day LaVar contemplates how to widen his vision and ponders bigger possibilities as more business partners come into the fold. He prepares to assemble a full-fledged branding team around Lonzo and envisions a media arm of his empire broadcasting all things Ball to the world. Shoes, memorabilia, a docu-series, a training academy. No idea is too big. “What we’re about to do has never been done,” LaVar says. The volume and audacity of his claims hardly matter now. For this to work, the boys must deliver. LaVar heads for the parking garage. He ambles slowly down an empty sidewalk. The dull yellow glow from a lamppost lights his way. His hulking frame casts a large shadow. He turns the corner and disappears from sight. The hour is late and he needs to rest. He’s doing TV in the morning.